The Jaguar E-Type (a.k.a. 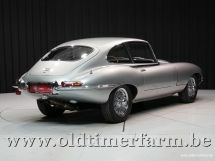 Jaguar XK-E) is a British sports car, manufactured by Jaguar Cars Ltd between 1961 and 1974. Its combination of good looks, high performance, and competitive pricing established the marque as an icon of 1960s motoring. More than 70,000 E-Types were sold. In March 2008, the Jaguar E-Type ranked first in a The Daily Telegraph online list of the world's "100 most beautiful cars" of all time. 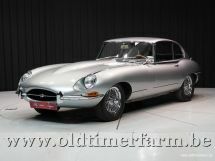 The E-Type was initially designed and shown to the public as a rear-wheel drive grand tourer in two-seater coupé form (FHC or Fixed Head Coupé) and as a two-seater convertible (OTS or Open Two Seater). A "2+2" four-seater version of the coupé, with a lengthened wheelbase, was released several years later. Later model updates of the E-Type were officially designated "Series 2" and "Series 3", and over time the earlier cars have come to be referred to as, sensibly, "Series 1" and "Series 1½". Of the "Series 1" cars, Jaguar manufactured some limited-edition variants, inspired by motor racing : The "'Lightweight' E-Type" which was apparently intended as a sort of follow-up to the D-Type. Jaguar planned to produce 18 units but ultimately only a dozen were reportedly built. Of those, two have been converted to Low-Drag form and two others are known to have been wrecked and deemed to be beyond repair, although one has now been rebuilt. These are exceedingly rare and sought after by collectors. The "Low Drag Coupé" was a one-off technical exercise which was ultimately sold to a Jaguar racing driver. It is presently believed to be part of the private collection of the current Viscount Cowdray. The New York City Museum of Modern Art recognised the significance of the E-Type's design in 1996 by adding a blue roadster to its permanent design collection, one of only six automobiles to receive the distinction. Hallmarks of Series 2 cars are open headlights without glass covers, a wrap-around rear bumper, re-positioned and larger front indicators and tail lights below the bumpers, better cooling aided by an enlarged "mouth" and twin electric fans, and uprated brakes. The engine is easily identified visually by the change from smooth polished cam covers to a more industrial "ribbed" appearance. It was de-tuned in the US with twin Strombergs and larger valve clearances, but in the UK retained triple SUs and the much tighter valve clearances. (Late Series 1½ cars also had ribbed cam covers). The interior and dashboard were also redesigned; rocker switches that met US health and safety regulations were substituted for toggle switches. The dashboard switches also lost their symmetrical layout. New seats were fitted, which purists claim lacked the style of the originals but were certainly more comfortable. Air conditioning and power steering were available as factory options. Engine : front-mounted straight 6 4235 cc, 3 SU HD8 carburettors, 12 valves, 3 speed, automatic, rear-wheel drive. Maximum power : 269 bhp at 5400 rpm; torque : 385 Nm at 4000 rpm. Top speed : 236 km/h (147 mph); 0-60 mph in 7.3 sec.